This Stainless Steel Bottle is 100% recyclable. Use only with ready-to-drink beverages. Suitable for fruit juices and isotonic drinks. Do not expose the bottle to extreme heat or cold. When using with carbonated drinks, avoid shaking and take care when opening. Caution: Alcoholic, fermented or nutrient-rich beverages may cause excessive pressure to build up inside the bottle. Fill the bottle to no more than 3cm below the rim. Do not use for non-drinkable substances, e.g. liquid fuels or other flammable, corrosive or chemical substances. Not suitable for the microwave (risk of explosion), for cooking or for deep freezing. Do not use for long-term storage of liquids. Bottle can be placed in the refrigerator. Take care when using with hot drinks (risk of burning). Discard damaged bottles. Great bottle. 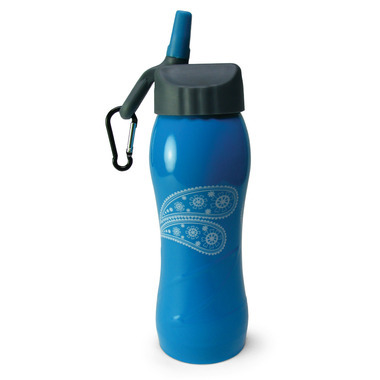 The spout doesn't have a plastic taste and the bottle itself is sturdy and attractive. Just what I was looking for!